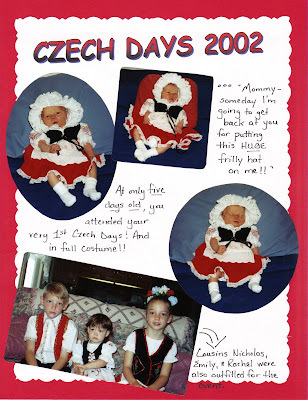 A Matter of Memories: Czech Days kicks off tonight in Tabor, SD!! Czech Days kicks off tonight in Tabor, SD!! So, I just got home from my conference in RC last night at about 8 p.m. (long drive home), have been at work again all day today and tonight will kick off the beginning of a VERY busy weekend!! It's CZECH DAYS in Tabor, SD! 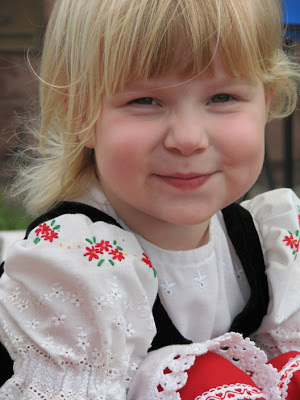 It's my hometown celebration and it's a BIG deal...especially for someone who is 100% Czech! Tonight they start off with a baseball game and fireworks and the next two days are filled with parades, games and carnival rides, authentic costumes, craft shows, and dumplings and sauerkraut (mmmm!). Hopefully, I'll have some more great pictures to share with you from this year's celebration soon! There has always the big parade on Friday at 1 p.m., but there is also a Kiddie Parade on Saturday morning where young kids can go through in costumes with gimmicky little slogans - like a little girl walking through with a plate of kolaces and a sign on her back that says "I'd walk a thousand miles to Czech Days for the Kolaces!!" Some get more elaborate than that, but you get the idea. Well, I've never put Kaitlin in the Kiddie Parade, but I'm getting the feeling that it's about time. I got to do it when I was little...now it's her turn. I've always hesitated 'cause I'm just not good at coming up with the gimmick...at least not one I liked...but I think I might just have something this year. I'm going to keep you in suspense though as to whether or not it's going to happen. If it does, I promise I'll share a picture or two! And, if you're in the area already or feeling like a road trip this weekend, I definitely recommend 'checking' out Czech Days!